XAML for Windows 8 offers 3 controls for toggling: toggle button, check box and toggle switch. 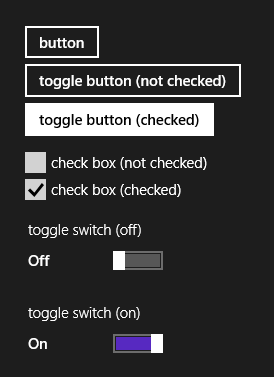 The Windows 8 UX guidelines explain and compare the check box and the toggle switch, but make no mention of the toggle button. How and when do I use it? Should I use it at all, considering the – in my opinion – lower affordance and discoverability? What are its pros and cons? A toggle button usually makes the most sense when you have a number of buttons to choose between. Something like a set of radio buttons in interaction. Otherwise, one toggle button on its own isn't clear in terms of either interaction or affordance, and the other options are better choices. As an EU, I cannot stand toggle switches. Claim the state or don't use it. "Off" can mean click to turn off, or it means, "It is off now." That's crap. What about color blind people? Highlighting the color in the control to identify its state is not user friendly in that circumstance. All binary decisions should be checkboxes, or radio buttons - or label the toggle switch with "currently...on/off" - which is more work for a silly control. I don't do much programming, but would never use a binary toggle switch. It causes people to make incorrect decisions. It may be "cute," but it is dysfunctional. From what I've seen, switches are used more for persistent system settings, whereas toggles are more contextual. So a switch might turn a service on or off, accessed from a settings panel but taking effect everywhere, while a toggle will act on the content that is currently in focus. Toggles do not need to be offered in groups. There are several valid examples of singular toggle buttons, such as "like", "favourite", or the bold format button on your word processor's toolbar. Explicit labeling should help you out here. When you have multiple toggle buttons, it is quite important that they appear visually related (in a group). When using a stand alone toggle button, have a label to make it explicit that it is a toggle and highlight/de-highlight the state of the button according to your visual theme. Rather than just putting it in a 'white state', grey out the off state since if is quite similar to 'disabling'. Not the answer you're looking for? Browse other questions tagged buttons checkboxes toggle windows-8 or ask your own question. What should a toggle switch do when using a multi-select? Where to keep 'logout' option in windows 8 surface tablet native app?